Day Two of the trip: December 26, 2009. 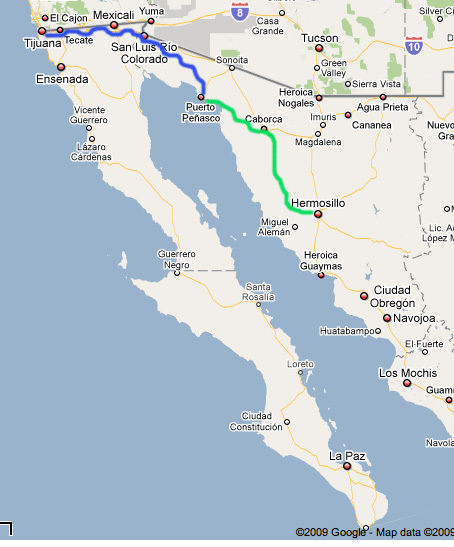 Starting point is Puerto Penasco, a few hours south of Arizona. Always an early riser, I left our hotel at 8:30 a.m. to walk around the Puerto Penasco oceanfront. We had picked a hotel in the downtown area, but on the other side of the bay I could see the high-rise condos that have become second homes for some Arizona residents. I wanted to find out what to do in Puerto Penasco this time of year. One merchant, just opening his storefront, sighed and said: “It’s too cold to go to the beach.” Back at the hotel, the staff scrunched their foreheads and came up with a few ideas: A small aquarium (read some TripAdvisor reviews here) and a regional museum. But no one seemed to have a recent or decent map to show me where they were. Meanwhile, the car’s alarm was going off for no reason and we couldn’t start the engine because of some electrical glitch inspired by the alarm. We got a hold of a mechanic who showed up in a car with a fake license plate. At the top of the plate (in small letters) were the words FORGET 911 (and in larger letters) IDIAL .357. An insignia of a gun made the point even clearer. Despite the less-than-assuring credentials, the mechanic did his job just fine. We had originally planned on staying in Puerto Penasco for a day, but decided to continue south in search of warmer climes. On our way out of town we passed a giant statue of what I think was a shrimp, representing the town’s fishing roots. We ended up driving about five hours to Hermosillo, the capital of Sonora. At first the landscape was flat and somewhat stark, masking the rich potential underneath the soil. Clouds of smoke emerged from the earth in four points – looking like distant tornadoes – where farmers were burning land for agricultural purposes. From the small city of Caborca (an hour and a half from Puerto Penasco) the land starts to ease into the mountains and hills of the higher desert. It becomes increasingly jagged as you get closer to Hermosillo and the tips of mountains look as as if they have been nibbled on by dinosaurs. Along the way, we got gasoline at a town called Benjamin Hill. I asked the gas attendant: “Who is Benjamin Hill?” I pronounced it in English, since it looked like an English word, but the attendant didn’t seem to understand what I was saying until I used a Spanish accent (Ben-ha-meen Heeeel). Then he told me Benjamin Hill was a general during “the war” (He is mentioned in this Sonora tourism site in as being involved in the Mexican Revolution). 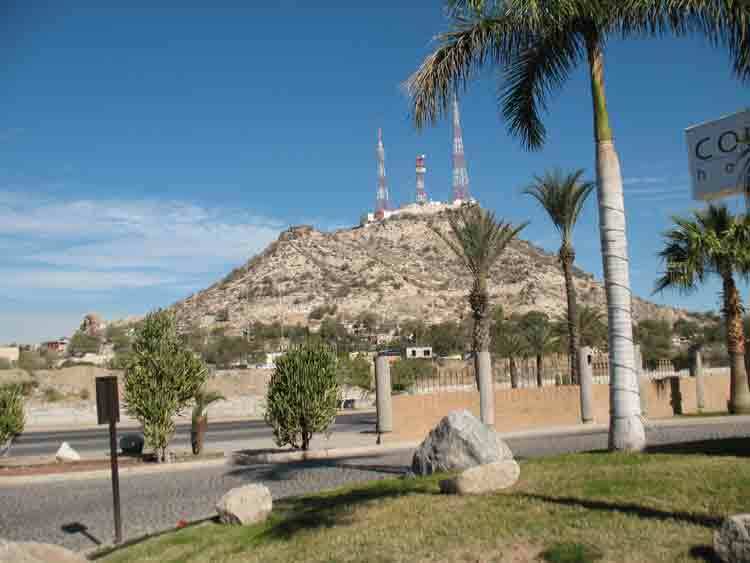 At Hermosillo, we checked into the Hotel Colonial near the Cerro de la Cementera (photo above) where we paid about $80 for a nice but small room. Sonora is known for its beef, and we missed an opportunity to eat a traditional steak dinner here. We also missed out on trying the famous Sonoran hot dogs (hot dog stands are lined up en masse in front of the local university). Instead, we ended up eating some beef tacos after seeing a movie in town. People often ask me whether Tijuana is really dangerous. 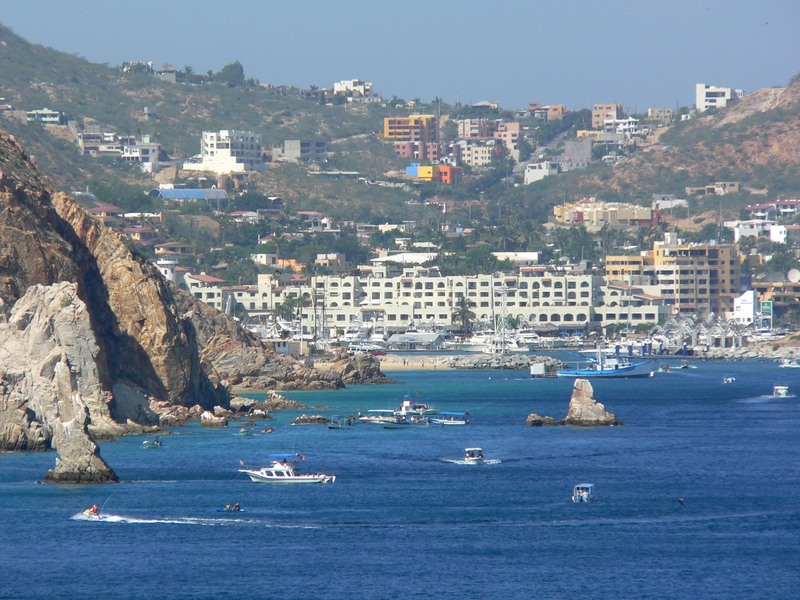 Well, the U.S. Justice Department’s Bureau of Alcohol, Tobacco, Firearms and Explosives apparently thinks the drug violence is dangerous enough to warn university students about visiting Tijuana and Rosarito Beach during the popular Spring Break period. Some universities have also taken up the “don’t go south” mantra. I have mixed feelings about these advisories from my experience living and working in Tijuana as a reporter. I wrote about some of the region’s most gruesome crimes – but I never got caught in the crossfire. Here is a recap of a recent, non-newsworthy Saturday evening spent in Tijuana. I arrived at Tijuana’s main cultural center, the CECUT, at 6 p.m. to attend a presentation by Mexican scholar Marco Antonio Samaniego on his new book, “Nationalism and Revolution: The events of 1911 in Baja California.” The presentation had a late start (Mexican time frames are typically looser than ours) so I wandered outside and bought some warm cooked corn, called elote or esquite. I like mine plain, but most Mexicans prefer the works: Chile, butter, cheese, lime, salt, you name it. Afterwards, I went to the restaurant Tabule to celebrate a friend’s birthday. Tabule is located along the main entrance to the Beverly Hills of Tijuana, a neighborhood called Chapultepec. There is also a Tabule in San Diego. I munched on assorted cheese, duck tacos and a tasty mushroom appetizer. By the time we left at 11 p.m., the place was just starting to get busy (Night life starts late here). I think I saw some police sirens at one point during the evening – but they were way in the distance. To get another glimpse of life in Tijuana during a typical weekend, check out Derrik Chinn’s blog where he recently posted an entry on what he did on a Saturday in Tijuana. The blogger over at Tijuana Bible, Lynn DeWeese-Parkinson, recently went to a soccer game in Tijuana. And Masa Assassin, an unidentified San Diego-based blogger, dishes about eating some birria tacos in Tijuana before heading to Ensenada this past weekend.